A quick tip that I use often; stop by your local pizzeria or restaurant and ask if you can buy some of their pizza dough. I can usually find a fresh ball of dough for only $1.25. This is a great option that saves time and money. Place a pizza stone or cookie sheet in the bottom of the oven until heated through. For fresh dough, cover flat surface with a generous amount of corn meal. Roll out pizza dough to desired thickness and shape. Transfer to cookie sheet or pizza stone. Drizzle with a little bit of olive oil and bake for 5-8 minutes, until slightly puffy. If using prepared crust, place in oven for 2-3 minutes before continuing on. Meanwhile, combine both cheeses, 3 Tablespoons fresh dill, minced garlic and salt and pepper. Slice smoked salmon in ¼ inch pieces, they will fall apart into chunks which is what you are looking for. Slice asparagus thinly and at a diagonal. When crust is done baking for the first time, remove and spread cheese over the surface. 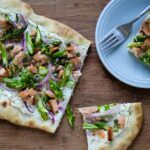 Top with salmon, asparagus, pickled onion, capers and a drizzle of olive oil. Bake for 10-15 minutes until crust is crispy and golden brown. Remove from oven and sprinkle remaining dill, cracked pepper and a squeeze of fresh lemon juice. Combine all ingredients except onions in a small saucepan. Heat until sugar and salt have dissolved. Remove from heat and pour over onions. Cover and refrigerate 2 hours. Can be stored for up to 2 weeks.